As I have continued my work researching unlabeled items in the Evanston History Center’s artifact collection, I came across a curious artifact from 1929. 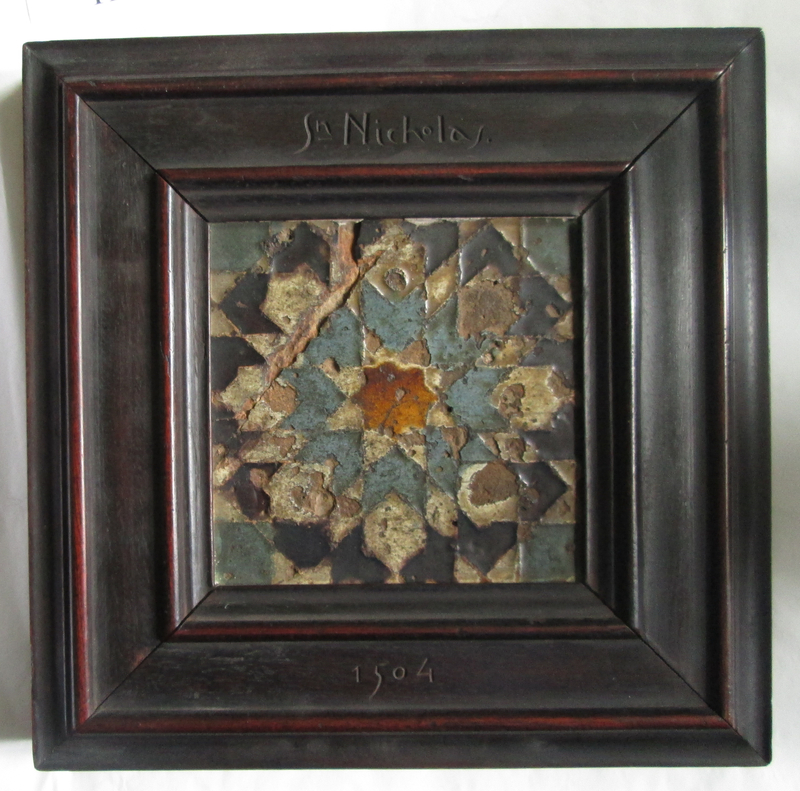 Primarily made of fine wood in a square, almost book-like shape, it contained not only a piece of artistic stone in its front, but official-looking, typed material on its back, affixed behind glass backing. Much of its heavily notarized text was in Spanish, and it made reference to the Caribbean nation of the Dominican Republic. Suspecting this object to be related to the life of Charles Dawes, I quickly began researching the connection between one of Evanston’s most famous residents and the Dominican Republic. One of the first sources I encountered spoke generously of an economic plan with which I was unfamiliar. “The term ‘Plan Dawes,’ under which the [Dominican] Government now operates, relatively is as well known and discussed in this small Caribbean country as [the European Dawes Plan],” a U.S. report on its customs receivership of the Dominican Republic (see below) stated in 1930 (1). Given this treatment, it is surprising that such an episode between one of our city’s most famous citizens and a sovereign nation, so brief as it might have been, has slipped through the cracks of historical memory. The typical narrative of the life of Charles Dawes often omits this moment of his participation in international relations on behalf of the United States. Whether at 225 Greenwood or in the pages of the Encyclopedia Britannica, the listing of Dawes’s achievements at the national level comprise his roles as Director of Budget in 1921; as part of the Allied Reparations Committee in 1923-1924; naturally, as thirtieth Vice President of the United States from 1925-1929; and as Ambassador to the Court of St. James (the United Kingdom) from 1929-1932. (2) Few biographical sources appear to mention the short gap between the end of his vice-presidential term, March 4, 1929, and the announcement by the White House of his appointment to the ambassadorship on April 10. (3) Dawes’s biographical article on the website of the Nobel Foundation explicitly mentions his role in the United States Mission to the Dominican Republic, but as merely a single credit in his many years of public service, with little elaboration or context. (4) Let us commence with rectifying this gap, through telling the story of the United States and the Dominican Republic, at the center of which General Dawes found himself only days after his term as Vice President of the United States had ended. The curious artifact from the Dominican Republic points to the nation’s gratitude for the American Mission. 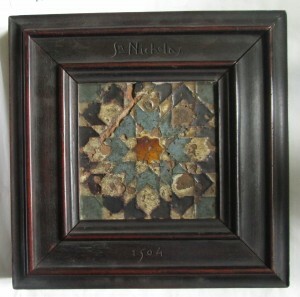 It contains, according to the short letter bearing the header and signature of Eliseo Perez Sanchez, government secretary to the Archbishop of Santo Domingo, a piece stone measuring 24 by 24 centimeters, covered by mosaic tiles coming from the Church of San Nicolas, built in 1504 and later destroyed. 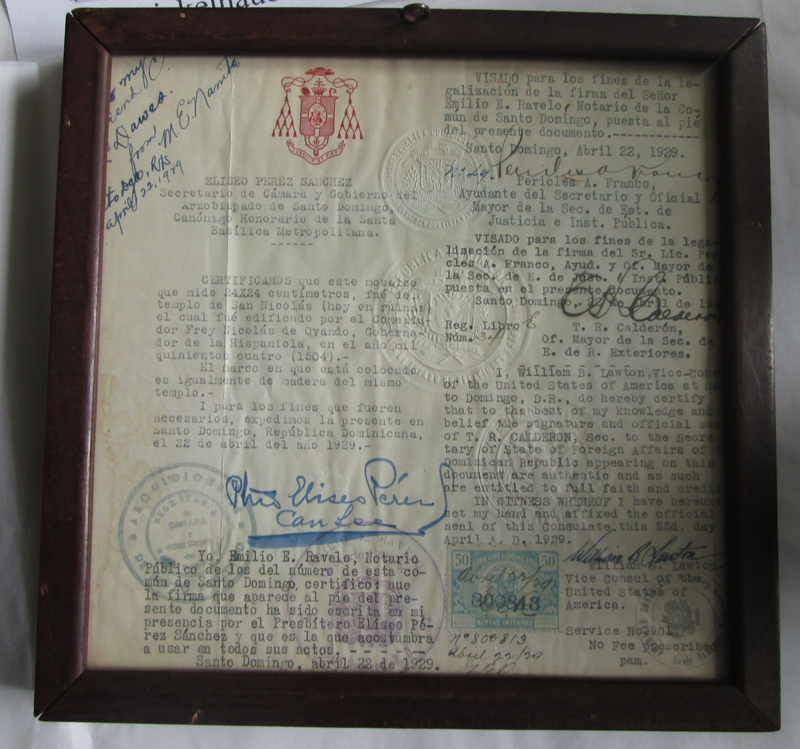 The statement of provenance is endorsed and notarized by other Dominican officials, along with William B. Lawton, Vice Consul to the DR. 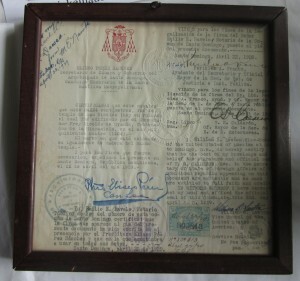 The letters all bear the date of April 22, indicating planning on behalf of the Dominican government in developing a meaningful gift for Ambassador-to-be Dawes. Some scholars have criticized the mission, claiming that it, like other American financial missions to the Caribbean, often “displayed a parochial vision that assumed reform simply meant copying American techniques” (25). While I will leave others more informed in Caribbean history to consider this point, it does appear that, even if the efforts were parochial or uninspired vision beyond the concept of a balanced budget, the Dawes mission’s efforts may be considered noble, in that they attempted to help the country stand on its own and take control of its fiscal destiny. While the American presence in the Caribbean may not have originated beneficently, in this instance, we have men of privilege using their knowledge and experience for benefit beyond their own. Such a task, so easily overlooked in the pages of history, ought not to be forgotten. Report on the Twenty-Third Fiscal Period, Dominican Customs Receivership Under the American-Dominican Convention of 1924, for the Calendar Year 1929 (Washington, D.C.: Government Printing Office, 1930), 8. Ibid. ; “Dawes to Great Britain,” Chicago Daily Tribune, April 11, 1929, 14. “Charles G. Dawes,” NobelPrize.org, <http://www.nobelprize.org/nobel_prizes/peace/laureates/1925/dawes-bio.html>. G. Pope Atkins and Larman C. Wilson, The Dominican Republic and the United States: From Imperialism to Transnationalism (Athens, GA: University of Georgia Press, 1998), 39. Ibid., 39-40; Eric Paul Roorda, The Dictator Next Door: The Good Neighbor Policy and the Trujillo Regime in the Dominican Republic, 1930-1945 (Chapel Hill, NC: Duke University Press, 1998), 13; “Loans of the Past Harass Dominicans,” New York Times, April 9, 1929, 5. Roorda, 14; DCR Report (1930), 7. “Vasquez Takes Risk in Accepting Budget,” New York Times, April 25, 1929, 7. “Dawes on Way to Santo Domingo,” New York Times March 26, 1929, 65; “Dawes Party Sails on Budget Mission,” New York Times March 29, 1929, 7. “Dawes Begins Task at Santo Domingo,” New York Times, April 4, 1929, 5. Ibid. ; “Loans of the Past Harass Dominicans,” New York Times, April 9, 1929, 5; “Dawes’ Work Aided by His Appointment,” New York Times, April 12, 1929, 9. “Dawes Presents Draft of Budget,” New York Times, April 17, 1929, 6. “Opposition Favors Dawes Budget Plan,” New York Times, April 16, 1929, 3. “England Accepts Dawes as Envoy,” New York Times, April 11, 1929, 3. “’I recognize Responsibilities,’ Dawes Says of London Post,” New York Times, April 13, 1929, 11. “Dawes Music Charms Dominican Natives,” New York Times, April 20, 1929, 26. “Dawes Plan Points Way to Dominicans to Reduce Deficit, New York Times, April 24, 1929, 1, 6. “Dawes Maps Out Budget System for Dominicans,” Chicago Daily Tribune, April 24, 1929, 25. “Dawes Back in U.S.; Alleges Budget Misrule,” New York Times, April 30, 1929, 21. Emily Rosenberg and Eric Foner, Spreading the American Dream: American Economic and Cultural Expansion, 1890-1945, (New York: Hill and Wang, 1982), 155.